Just as everyone’s clothing wardrobe benefits from a few low-key, comfortable items to pull on without thinking, perfume wardrobes need the same. It is present, yet close to the skin — me, but better. I almost feel it rather than smell it. But if you want a perfume to rest lightly around you, like a second skin...you could do a lot worse. One thing is left, that, void of stain or smutch, I bear away despite you ... My panache. Panache is meant to be a unisex fragrance "centered around" vetiver. I don't think your average vetiver fiend will find it passes muster as a vetiver scent, and by the same token, if you hate vetiver you needn't necessarily cross Panache off your list. It's probably just as well: I am a vetiver fiend, but my vetiver fragrance needs are already more than adequately covered. Panache opens on a peppery-boozy rum (the notes: ambrette seed, baie rose, magnolia, bergamot, rum extract, vetiver, jasmine Sambac absolute, geranium, ylang ylang, cardamom, oakwood extract, olibanum, Cosmone, Serenolide, Moxalone, cedar, amber and honey). It's slightly nutty and green, and it's strong for all of 3 or 4 minutes before settling into the "veil of scent" or "second skin" that ties it stylistically to Mythique. The heart has a distinct floral aspect although magnolia is the only flower I really notice. The base is warm and soft and musky. There is vetiver, yes, but also honeyed wood, and the oak in particular stands out. The combination of rum, honey, cedar and oak call to mind my old favorite, Serge Lutens Chêne, and while they're far from dupes, Panache could be a variation on Chêne — a Chêne for the fragrance customer who doesn't want to be bopped over the head with a block of just-cut wood still oozing sap, perhaps. Panache is smoother, gentler, kinder, and as with Mythique, it has a way of lingering long after you stopped thinking about your fragrance; more than once, I was surprised to find that my arm smelled awfully nice. I liked Panache the first time I tried it, but I wasn't wildly enthusiastic. Later wearings have increased my affections. It's going on my buy list, but there are many things on my buy list that I'll probably never pay full price for, and Panache will be one more. Still, you never know when you'll get lucky, right? 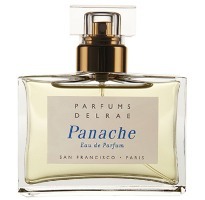 Parfums DelRae Panache was developed by perfumer Yann Vasnier; it is available in 50 ml Eau de Parfum, $150. For buying information, see the listing for Parfums DelRae under Perfume Houses. 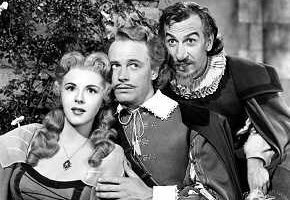 Note: top image is from the 1950 film version of Cyrano de Bergerac starring José Ferrer. I love the name! When you say”nutty”, can you distinguish what kind you are picking up? The way I am wording this is starting to make me laugh. You’re killing me (or possibly my wallet, anyway)! I adore Mythique, and am a big fan of Chene, too. I can see I’ll need to try this one. Angie, will be interesting to see if you like this one. Yeah, better for the wallet if you don’t. Robin’s review is also killing me!!! I LOVE Chene, that kind of everlasting love. I could wear Chene days in a row and never tire of it (at least I think so, haven’t really tried it for more than two days) . There is something so pleasing yet intriguing about it. I am very eager to try Panache. Oh, I understood that it was not a dupe, but my Chene love is go great I thought that anything vaguely resembling it is definitely worth a try. Gaaah! Passed up on a split of this and your review is making me regret it a little bit. Another time perhaps. I do love vetiver but those skin scents bore me to tears! That said, they do serve their purpose for me when the mood strikes and I do wear them. Last night I wore Iris 39 and woke up to such a light veil of springtime. I’m wearing Dzing! right this second and it’s perfect . That’s my kind of ” my skin but better” scent too. T – I read @ The Non-Blonde this morning that L’Artisan has discontinued Dzing! Isn’t that carzy?! I had a feeling that was coming. Too, too bad. It is true, and sometimes they’ve appeared to have been gone for some time and then come back. So. Still, if I absolutely needed to have Dzing on hand, I’d be buying an extra bottle. This is why I have mostly stopped reporting on discontinuations…too hard to find out the truth. Yes Rustic I read that too! GAAAAAAAAAAAAAAAAH! Bastards! Why??????????????????????? That’s why I’m swimming in it right now. It made very sad, loving perfume the way we do is downright dangerous. For certain, though? I mean, hasn’t that been rumored a number of times before? Hi Boo – according to Gaia, it’s a definite. Guess I’d better hurry up and make up my mind whether I “need” some then… and then find a split. Seems like one was just done, too. Tamara, this one might bore you then. And was going to say — Iris 39 is not MY idea of a light veil of springtime, LOL!! Just kidding. I know nearly everyone but me loves it. It definitely is not my type of scent at all , but a *decant of it seems necessary. I see it being worn in the summer with a white sundress and cute flats. Peppery-boozy rum sounds divine, although having just re-read Angela’s lovely review of Mythique, that sounds more my thing ultimately. But the prices are pretty much out of my range. And at TPC Mythique is going fir $6.25 for a 1 ml sample. Pricey, if it’s something you love. Oh dear. Oh DEAR. It is a spendy line at this point. When I bought Debut back in 2004, it was $80 — don’t know if PdR has gone up more than other lines though. I haven’t checked recently, but for awhile you could get very reasonable samples direct from Parfums DelRae. Whoops, just checked. GAH. They used to charge $1.00 each for samples, and are now charging $10 to $15 (! that’s for the Panache, too) for 1.5 ml vials. Granted, $1.00 is certainly not enough, but one would think they could stop at a price commensurate with what Luckyscent ($3 ml), or at least Beautyhabit (which has also gotten super pricy, $5 a ml) for something that is supposed to gratis. Yes, if they want us to at least TRY their line, they are not making it easy. Well, there is still LS at $4, and Aedes carries the line as well (though I don’t see Panache there yet), with a great sample program. Robin, this sounds Really, really lovely. Must try, for sure. Cedar is sometimes problematic for me – can be brash on my skin, but in a subtle supporting role, it can work and that appears to be the case here. The combo of honey, boozy, woody notes sounds delightful. I *think* this is too light to be brash, even if you applied it heavily? But you try it and tell me if I’m wrong — my tolerance for cedar is huge. I am a little concerned about the cedar as well…..but I like this line in general so this is firmly in the “must try” camp. Add me to the list of those who suddenly added this to the must-try list (still haven’t tried Chene, which has lingered there for ages). Peppery boozy rum and honeyed wood? Yum. I may have a smidge of Chene I can send you. Aren’t there some other things I’m supposed to put together for you too? Oy, my incredible shrinking memory. Gah! Yours and mine both! I *know* I’m supposed to send you some things, but then you went out of town…and by now I’ve forgotten. The only thing I remember is the Sands of Aqaba. Maybe it’s just…changing. Sometimes I feel like mine is shrinking, and then I realize that I’m just remembering different things. Like, I used to be terrible with names, and now I’m just middling… so I’m actually remembering *those* better, while I’m forgetting other things more. You mean a white floral variation on Mythique? Because Panache is *not* a white floral; it’s almost certainly classified as woods of some kind. Hmmmm. Must try. Mythique totally snuck up on me. I still can’t remember why I own a bottle until I put it on. Then I want to wear it and nothing else for a week. Amoureuse and Bois de Paradis are both on my why-don’t-I-have-a-bottle list. It’s a great line. Even Coup de Foudre, which got such lackluster reviews, is really very pretty. True, but they still have the same sort of “new french” feel. I like to think of it as balance. Clearly they learned a lesson from the sales of Mythique, which I heard were quite good, and they did start out with those sparkly ones–Illuminee, and Debut. Hope they don’t give up altogether on perfumes like Amoureuse and Bois de Paradis, though. Robin, I tried this recently and liked it a LOT. I know what you mean about the nutty quality – perhaps it’s the combo of vetiver and florals (or the cardamom?). It’s the same quality I pick up in my beloved Shaal Nur, which is also a combo of vetiver, florals, and incense. Panache seems softer around the edges and more quiet. Just great! You might be right. It’s weird, I hardly make out the cardamom here except that a couple times it struck me as ever-so-slightly sweaty. I do love cardamom & wish it was stronger. I love cardamom, too, and to be honest I would not have picked it out as a note! I often get nutty/chewy from vetiver… Sycomore being a prime example. And the cookies/cereal in Vetiver Tonka! In fact, I think the whole point of the tonka in that one is to bring out the nutty aspect of vetiver. Ok.. My lemming gland is waking up. Peppered honey boozy and woody- hello! Must find who stocks them in UK. Agree, it’s a “must try whatever they make” line. I love, love, love Mythique and can’t wait to try this! I hope though it isn’t too “comfy” (the honey?) because what I adore about Mythique is that “crisp white shirt on a breezy morning”-quality! Will be curious to hear what you think. I would not call it comfy *or* crisp. “I am a real perfume my love!” And I want a FB no matter how impossible it may seem that I would ever drain it. I still think Amoureuse is the best they’ve done so far. Debut is the one I bought though. They are both so classically beautiful! I have wanted a bottle of BOTH for such a long time, but can’t decide out of the two which suits me more. I think I am with you a would more than likely buy the Debut. Amoureuse would be a purchase if I lived in some glamorous city, which I don’t. I live on an island that you can only get to by ferryboat… not too many people around here wear perfume. I love it in spite of the honey. It’s a beauty, but not easy to wear! I think my next trip to Barney’s is going to be dangerous!! Between this and the new l’Artisan and the new Malle, I have a feeling I’m doomed. LOL…yes, getting past all 3 might be hard!